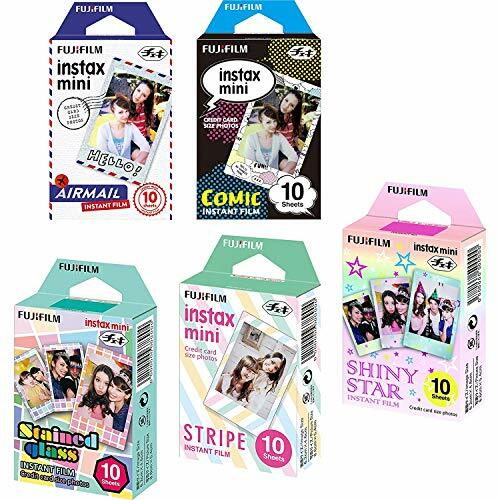 Fujifilm Instax Mini 5 Pack Bundle Includes Stained Glass, Comic, Stripe, Shiny Star, Airmail. 10 sheets X 5 Pack = 50 Sheets. The Fujifilm Instax Stained Glass Instant Film (10 Color Prints) offers stunning instant pictures that you can fit into a purse, wallet or mini photo frame. Instax film ensures sharp, clear reproduction, vivid color and natural skin tones. The Fujifilm Instax Shiny Star Instant Film (10 Color Prints) offers stunning instant pictures that you can fit into a purse, wallet or mini photo frame. Instax film ensures sharp, clear reproduction, vivid color and natural skin tones. The Fujifilm Instax Stripe Instant Film (10 Color Prints) offers stunning instant pictures that you can fit into a purse, wallet or mini photo frame. Instax film ensures sharp, clear reproduction, vivid color and natural skin tones. The Fujifilm Instax Airmail Instant Film (10 Color Prints) offers stunning instant pictures that you can fit into a purse, wallet or mini photo frame. Instax film ensures sharp, clear reproduction, vivid color and natural skin tones. The Fujifilm Instax Comic Instant Film (10 Color Prints) offers stunning instant pictures that you can fit into a purse, wallet or mini photo frame. Instax film ensures sharp, clear reproduction, vivid color and natural skin tones.